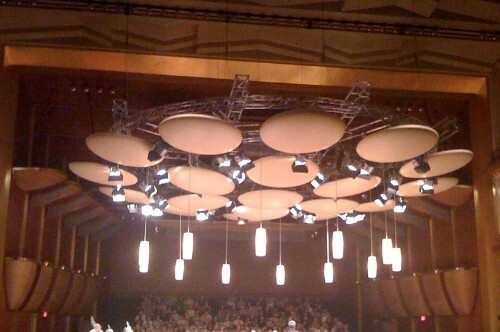 Avery Fisher Hall, transformed for Mostly Mozart into an acoustic marvel. Pre-concert performances at the Mostly Mozart Festival of Lincoln Center feature up-and-coming musical talent. Even Emmanuel Ax! But most often artists whose names are just coming over the horizon. The transformation of Avery Fisher Hall for the Festival provides first-rate acoustics and an intimate feel. The environment is perfect for the performance of Brahms' Trio for Clarinet. Joining together for the performance are pianist Jon Nakamatsu who runs the Cape Cod Chamber Music Festival with Jon Manasse, a clarinetist. Manasse plays in the Mostly Mozart Orchestra with cellist Ilye Finkelshteyn. Brahms had declared himself finished with composition until he heard the clarinet played by Richard Mühlfeld. He rushed to compose his Trio for the artist. What a piece in the hands of Manasse, Finkelshteyn, and Nakamatsu. Voices often interplay, sharing a figure and then splitting up or the reverse. Technically strong and richly expressive, each instrument contributed alone and with the group. Nakamatsu has an extraordinarily limpid and liquid approach. Brahms sounded seductive as the audience was swept to the finale. On another night, Erika Switzer and Tyler Duncan braved Schumann's Opus 24 song cycle, one that is not commonly heard. This duo submitted a disc of their work to the Festival and were hired an hour later. In their hands and voice, Schumann came to life in all its curious complexity. The disconnect between the text of Heine's poetry about the angst and despair of love and life and the inevitably joyous music of the composer was bridged by the artists, phrase by phrase and song by song. From the start, a jaunty, joyful awakening conflicts with the text, in which the anticipated lover does not return. The second song has sharp staccato attacks on the piano. The singer ranges wide, changing dynamics and textures. This song is very quick. And so it goes through the songs. Contrasts between the pensive, plaintive single notes of mood songs in which a gently rocking piano underscores an almost bel canto baritone contour. Then strong beats suggest mimicked speech. Switzer choses to go with the composer's exuberance, finding pleasure in arpeggios, in a walking gait or a chord's repetition. She uses various tempi to indicate changing moods throughout the song cycle. Duncan looks for the text's meaning as he wraps his robust baritone, edged with steel, around the words of sadness and anger. Switzer speaks about fighting all the time with Duncan as they work. Duncan agrees, but says they also have fun. What the battle yields is performance of great interest on a base of technical surety. To realize the musical variety and emotion in these songs is a difficult job. Switzer and Duncan deliver a rich rendition full of interpretive subtlety. They are working on a production of Brahms' only song cycle, The Beautiful Magelone, a salivating prospect. Clearly Mostly Mozart is giving gifted young artists a platform to show their stuff to appreciative pre-concert audiences.